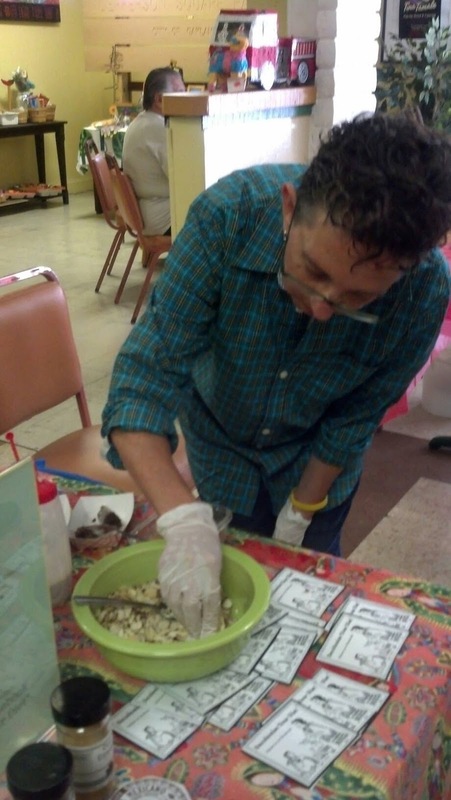 About a month ago, our neighbor Eric told us about a tamale cook-off and fiesta, benefiting La Clínica de La Raza. We are expecting around 200 attendees. Each competitor will submit 200 tasting portions (approx. 5 doz tamales). You will prepare your tamales in advance and we can provide space to do final prep on site, if needed. Prizes will be awarded for People’s Choice and Judge’s Choice for best Meat, Vegetarian/Vegan and Wildcard (creative) tamales. This fun event will provide a great way for you to promote your business. Each competitor will be given $50 to offset costs. The guidelines sounded challenging, but doable, so Luz decided to give it a try. The organizers had planned that competitors would cut their tamales into four or more bite-sized portions so that they would have enough for 200 tasters, but Luz decided to make smaller “dessert tamales” so that each person could have their own tamal/tamale/tamalli. Tamale-making is pretty adventurous in our familia. Even the form is a discussion: from Luz’s families folded Sonoran Classics to Catriona’s family’s rolled-and-tied New Mexican tamales. The content varies quite a bit as well: Luz’s family has been making vegetarian green-chile-and-cheese tamales for decades, and they often make a sweet tamal: sweet bean (pinto beans, canela, piloncillo) with raisins. This latter is a smaller tamal, perfect with a cup of coffee for desayuno. Luz wanted to introduce the festival-goers to a Mexican hot chocolate inspired tamal, with cacao, canela, almond, and chile. The great thing about this tamal is that it’s not too sweet, and that the sugar is balanced out by the corn masa, so it shouldn’t cause a dramatic blood-sugar spike. So, the Saturday before the event, Luz set out to make 200 taster tamales. By making them alone, they could portion out the masa and filling, so that size was consistent, and there was enough filling for all two hundred. The masa included organic tazo hot chocolate tablets and canela, and the filling was nutella inspired, made with almond and hazelnut butters and cacao. Catriona described the texture as akin to a brownie. One festival-goer said it was like a chocolate doughnut, which made us laugh because Luz started the Decolonial Cooking Club because their CSUEB Ethnic Studies students were selling krispy kreme doughnuts as a fundraiser. So we prefer to think of this xocolatamal as the anti-doughnut. Luz’s protegeé Adilia came to Oakland on Sunday to help work the event. They served the tamal on a bed of slivered almonds, with coconut creme and a sprinkle of chile and salt. Knead masa well (for at least 15 minutes but preferably longer). Add in whipped oil and knead some more. Add flavoring and knead in until thoroughly mixed. Put filling ingredients in a food processor (or go old school and use a molcajete) and blend into a smooth paste. 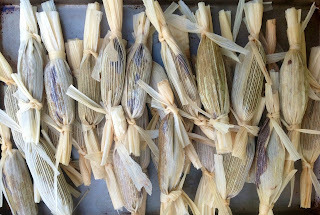 Spread about one tablespoon of masa on each corn husk. Add 1 scant teaspoon of filling. Fold tamale as desired. For these small tamales, I like to roll them like a cigar and tie each side. Prepare a large tamale steamer. Add boiling water and then stack the tamales above the steamer tray. Put a damp dishcloth on top of the stacked tamales and tuck it in. Close lid. Turn heat to high for 10 minutes and then lower to medium high for 50 additional minutes. Check a sample tamal. If the tamal is done, it should be firm enough to hold its shape and come off the husk without sticking. If it seems raw, continue cooking in 30 minute increments until done. Many factors affect cooking time. Sometime my tamales cook in 1 hour, sometimes they take 2 hours or more! In general, small sized tamales take less time to cook. Optional: Garnish with coconut cream, sliced almonds, or salt combined with chile (or all three).